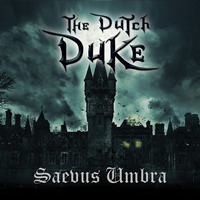 The heavy metal newcomers THE DUTCH DUKE are bringing us all a brand-new EP “Saevus Umbra”, which starts with the song title of the work, having some special effects howl of wolves and a storm sequence a killer battery with fast riffs and a potentially serious vocal. Within seconds the chorus is already etched in my head, sounding quite interesting composition that pleased my ears quiet a bit. The killer drums gives sequence in "Blooded Sights" with very melodious riffs, power is maintained throughout the song, and once again a chorus of those do you decorate easily and sing along. The guitar solos are more present and not disappoint, making any headbanger shake his head at the sound of the second track on the disc. In "No Mercy" we have a voice with more torn and sharp lines, bringing a bit of heavy metal feel that is like something old school from the eighties. The elements brought in by THE DUTCH DUKE are quite mixed among the old genres of the heavy metal, and an innovative air of the recently launched style bands, as is the case. The disc ends with maybe fastest songs in "Dracula" we note that despite the EP bring only 4 songs presents an interesting variation of band members showing what came these guys can print a promise and both the local scene, and maybe even the world of heavy metal.